I’d hoped to show the Scroop Rilla Corset on models when I launched it, but unfortunately due to timing issues that wasn’t possible. Happily, we’ve now managed to do a full photoshoot with the Rilla, and I can show you how it looks on actual bodies! 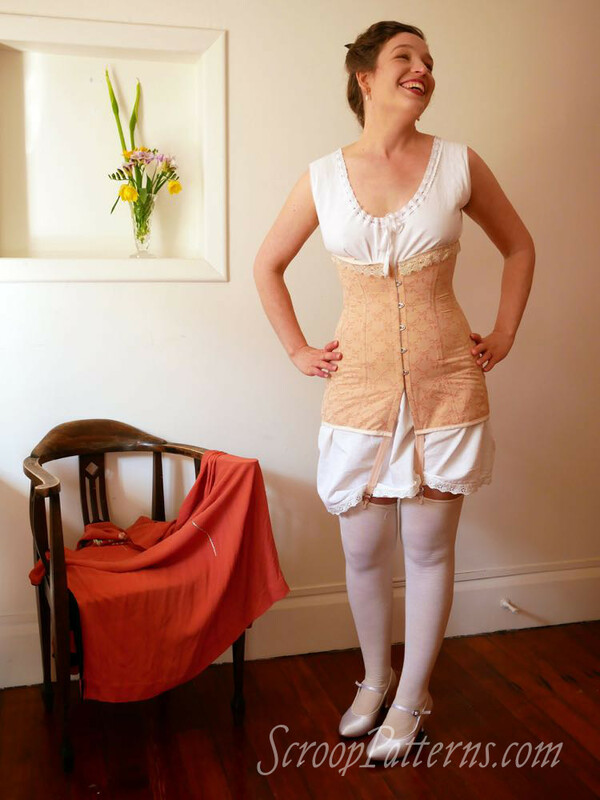 Both Jenni and I are wearing the Rilla Corset in size 38, with Average hip flare. Jenni wears View B in white coutil, and I wear View A in peach pink brocaded cotton. The size 38 in Average is a perfect match to my measurements. Jenni has an exceptionally small waist compared to her hip size, so the ideal Rilla Corset for her would be custom fitted to her measurements: shortened, as she is petite, and let out slightly in hip and at the underbust, to accomodate her amazing curves. I give guidelines on adjusting for fit in the Rilla Corset pattern, and will also be demonstrating custom fitting on Jenni in a later post. Although not an absolutely ideal fit, the standard pattern still fits her quite well. 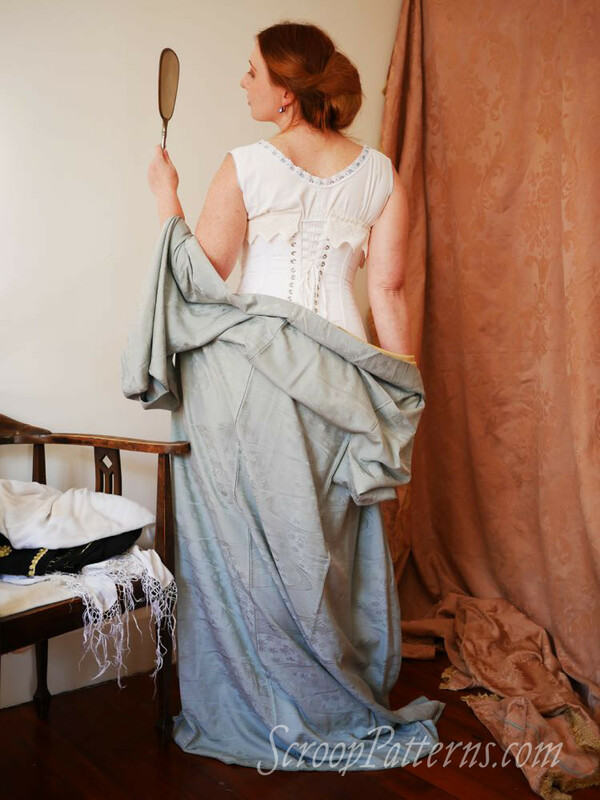 We both put on our corsets right after eating a big (and delicious) lunch, and then spent a couple of hours in them hanging out, posing, sewing, grommeting another corset, and lounging on the couch reading my vintage 1910s magazines and Alexandre Dumas’ Louise de La Vallière (scandalous!). 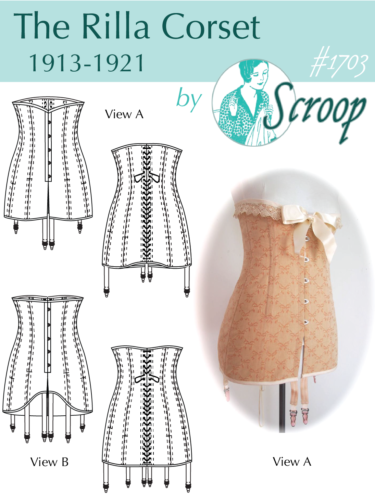 Perfect proof that you can comfortably live and work and do things in these corsets! Both Jenni and I are wearing combinations made from Wearing History’s ca. 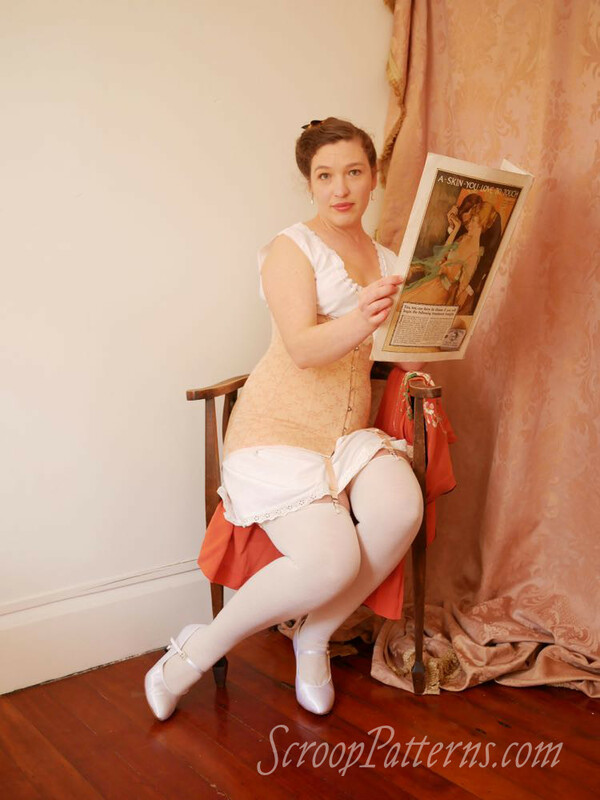 1917 Combination & Chemise pattern, Rosalie stockings, and earrings by Dames a la Mode. Jenni’s shoes are 1990s era Louis heels, and my shoes are modern ballroom dancing shoes. Huge huge thanks to Jenni & my amazing photographer for their work. They are such amazing women, and I’m very grateful to get to work with them, and to be their friend. Further pictures will be appearing on the Scroop Patterns product page shortly! The corsets look great! Your treadle machine is so pretty, do you use it often? Thank you! Unfortunately I need to get the belt on the machine replaced, so right now I can’t use it. The plan is definitely to use it! Next PostHave a Scroop-tacular Halloween!